Owning or operating within a warehouse in the Bronx can be a chore. The facilities usually encompass large operations that could stand to grow or are simply storing property that is being used for other companies. Whatever the case the warehouse economy in the Bronx is like the rest of the city, tough and high priced. Our facilities have been rated the highest of in NYC, and our Bronx location is no exception. If you’ve considered expanding your warehouse storage and want to maintain a low budget while doing it, we absolutely know how to make the most of your dollar. The quality of our facilities is one aspect of our high ratings, but the other is the main factor in a lot of customers’ decisions: price. 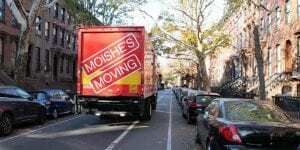 The price of purchasing a warehouse in the Bronx is high, and Moishe’s offers a great series of alternatives to help save the money in the short and long term. You could go with our mobile storage options like we mentioned above, or our commercial storage services. It really depends on the type of property that you need stored, for example, you may need records storage in the Bronx for all of those all-important vital records – whether commercial or personal. If you’re selling a product, it may be prudent to rent out mobile storage next to your warehouse during the busy season, or even year around if you need it. More specialized and long term storage possibilities are great for commercial storage options in our Bronx facilitiy. Whatever the case may be, our storage advisors can help you in your decision. However, ultimately the choice is up to the customer. We make sure that the options will always satisfy the customer no matter what type of storage they’re after. Our ability to provide extra warehouse storage has never been better, as our company has been constantly improving for the last four decades. We can assist you now in your storage capabilities better than we ever have, and it’s only going to get better. While our mobile storage options are secure and nigh on impossible to infiltrate, you’ll find our commercial storage facilities are exceptionally protected. We believe that all storage whether commercial or residential should be held to a standard that gives our customers peace of mind. You’ll find nothing but security at every Moishe’s Self Storage location. This means that your commercial warehouse storage will be guarded by a security crew in our Bronx facility, with the assistance of a CCTV system. When you need to be protected by professionals you’ll find the best security New York can offer at Moishe’s Self Storage Bronx. How do I Begin the Warehouse Storage Process? If you’re up to your ears in delivery requests, shipping orders, and property then let our storage advisors handle the process. We make sure that every storage request is handled efficiently and effectively to save you the money you need to expand your business. You can find Moishe’s online here at our website by contacting us through our form. If you’d prefer to speak directly with a storage advisor call in to speak with one at our Bronx location by dialing (800) 536-6564. There’s no need to worry about warehouse storage ever again with our storage team. Call now and end your self storage worries in the Bronx today.